Americans, at least, have a tremendous appetite for meat, dairy products and eggs. They have little appetite, however, for information on the lives of the animals who produce what they eat. Perhaps they sense something. Do they sense that beyond the mountain of steaks, hamburgers, sausages, cold cuts, ice cream, milkshakes, cheeses, pizzas, pastries, soufflés, and omelets consumed each year lies a whole mountain range of animal suffering and death? Most cannot see it. For them, what might be disgusting to the heart and the eye is blocked off by the cravings of the palate. Out of sight, out of mind, as the saying goes. It is hard to see it, this mountain range of pain and destruction, for it is obscured by the mists of popular myth and the fog and haze generated by the animal industries. On television, sleek cows graze in lush fields while dairy industry advertisements tell us that “milk is a natural” or that it builds beautiful bodies. Or we are told that animals love to be eaten, as in the Oscar Mayer jingle in which a chorus of children sings: “I’d love to be an Oscar Mayer weiner … then all the kids would take a bite of me.” In Starkist’s ads, Charlie the Tuna was always frustrated because he wasn’t chosen to be hooked, hacked to death, and canned. And so they are. Ten billion moving things that liveth are killed and eaten each year in the United States alone. All these lives … confined, controlled, snuffed, then poured into that mountain of animal flesh, fat, and fluid. The average American consumes heavily of it — about 850 pounds, in retail weights, of meat, eggs, milk, and cheese yearly. Animal foods from food animals … Food for thought and thinking: The late, great human brain is a wonderful organ. It generates both deep emotion and acute awareness. So it knows how to take care of itself. It can shut out disturbing things — especially things that might interfere with pleasure and satisfaction. It is never better at this selection/ommission job than when it encounters information about the living beings who feed it. We need to think that they feel nothing, that their lives have none of the content of our own. We need a great, unbridgeable distance between them and us. WE need it to separate them from us so that we can be more comfortable with them serving (and being served to) us. And this is what makes it all so wrong. We degrade other life. We destroy a sense of kinship with the living world. We alienate ourselves from all of nature — all to keep up some old habits and appetites. These are costly: they cost us a sense of belonging here so that we can treat all of the world like a supermarket and a parking lot. They cost us too much of our empathy and feeling for the living world. Ultimately, humanity’s great reduction of animals has greatly reduced humanity. The reduction began nearly 10,000 years ago in the Middle East, where tribes who specialized in hunting wild sheep gradually learned to capture animals and control flocks. They soon learned that by castrating males and separating females, they could control mating and breeding in their animals. In time, these and other animal husbandry techniques produced docile animals in the sizes, shapes, and colors, and with the kinds of horns and coats desired by their tribal keepers. 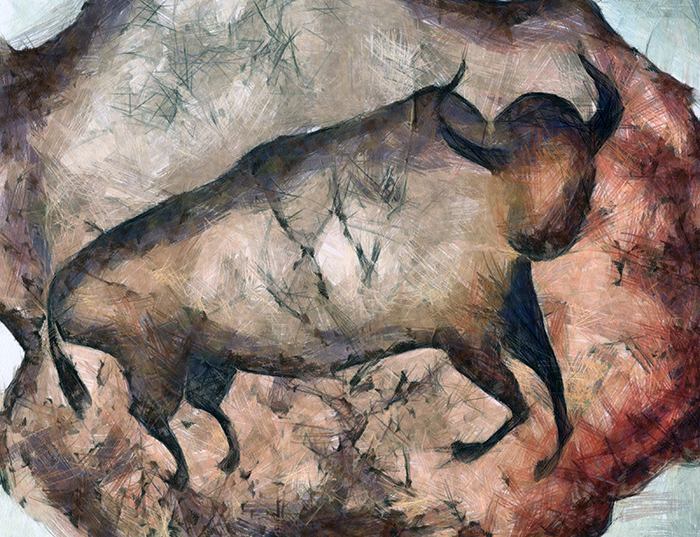 In nearby regions, tribes who specialized in hunting wild goats, cattle or horses, took similar steps toward domestication and animal husbandry. This course of domestication, however, brought radical changes in the herders’ relations with animals. As forager/hunters, they had viewed animals as autonomous beings and as partners in the scheme of life. For many of these societies, animals were the creators of the world and they taught people how to hunt, build fires, and live. Often the animals hunted were believed to be ancestors of the tribe. People believed that a Master of the Animals — a chief or leader of the animal herds — had made an agreement in the distant past with an ancestral tribal leader in which the tribe could hunt and live from the herd so long as it performed proper ceremonies and rituals. Above all, forager/hunters believed that animals had supernatural powers of their own that could affect the livelihood and well-being of the tribe. Animals were the tribe’s partners, but they were also forces of the mysterious living world around it. Parts and pieces of these beliefs persisted well after domestication, as in, for example, the many bull, ram, and calf deities of some of the early agricultural societies. Gradually, however, herding and settled agriculture took the place of foraging/hunting and people took a new position in, and a new view of, the order of the living world. As agriculturalists and animal breeders, they were taking control of animals and many of the natural forces that had once been respected as supernatural powers or dieties. Other beings and forces that had once been seen as ancestors and partners came to be seen as slaves, resources, and agents for the benefit of human beings. Human beings took over the powers of animals and nature, and, as a result, they came to view the living world as a pyramid, with humanity at the pinnacle. The transition, some say, forced the greatest psychic upheaval in the course of human evolution. Culturally speaking, we turned the world upside down. It appears that we are still recovering from the shock. In time, the reduction of animals and nature became the basic principle of Western civilization in both religious and secular thought. It was already the dominant worldview in Sumeria when writing — and history — began 5,000 years ago. It was expounded and expanded by both Old Testament scribes and Greek philosophers. It was strengthened by both Christian writers and philosophers of the Age of Reason. Rene Descartes, especially, was a major booster, as was Karl Marx and his students. It has had a stream of opponents over the centuries — Pythagoras, St. Francis, various 19th century poets, feminists, to name a few. But it remains the dominant idea governing how humans are to live with the rest of the world. It feeds and legitimizes all of the froms of animal exploitation, whether they are of the realm of sport, science, or industry. Today, the West’s 5,000-year obsession with animal/nature reduction is expressed in two violent, virulent forms. One is vivisection, in which animals are reduced to the status of test tubes —specifically bred to be given human diseases, injuries, and conditions. The other is intensive animal husbandry or industrial animal production — better known as “factory farming.” It is, in all respects, a child of modern science and the industrial revolution. Its overriding goal is to force animals raised for food to produce more from less and to do it faster. It considers the farm animal as a food machine — to be designed, modified, tuned up, and souped up. It draws on biology and chemistry for the high-powered tools it needs to manipulate animals’ bodies, breeding, and physiology. It draws on industrial technology to create the factory “environment” — one designed to assist the biological manipulations as well as to take the labor out of handling and caring for animals. Like any other factory, the factory farm is geared for mass production, and it uses automation and other assemblyline techniques to get it. Factory farming began in the 1920s, not long after the discovery of the roles of vitamins A and D. When these were added to feed, chickens no longer needed sunlight and exercise for growth and proper bone development. That made it possible to raise large flocks indoors, year around. But chickens did not thrive in the large, corwded buildings. Diseases spread like wildlife and some birds pecked others to death in a frenzy. By the 1940s, though, the broiler business was getting big enough to attract poultry experts to solve its mass production problems. Their strategy was to modify the chicken to the factory system. One found a solution to mass pecking and cannibalism: he burned off the tips of birds’ beaks with a blowtorch. Another expert invented an automatic debeaking machine, and debeaking became routine in the industry. With World War II came antiobiotics, and the broiler industry quickly learned that these drugs made chickens grow faster. Poultry geneticists joined the effort and created the prototype for today’s broad-breasted, fast-flesh broiler ckicken. Other poultry scientists found out how to speed bird growth by playing with feeding times and artificial lighting. The push for speedy growth was entirely profit driven: fast-growing birds reached market weight on less feed, the biggest expense in chicken production. In addition, fast-growing birds meant more flocks per year out of the increasingly expensive factory buildings. 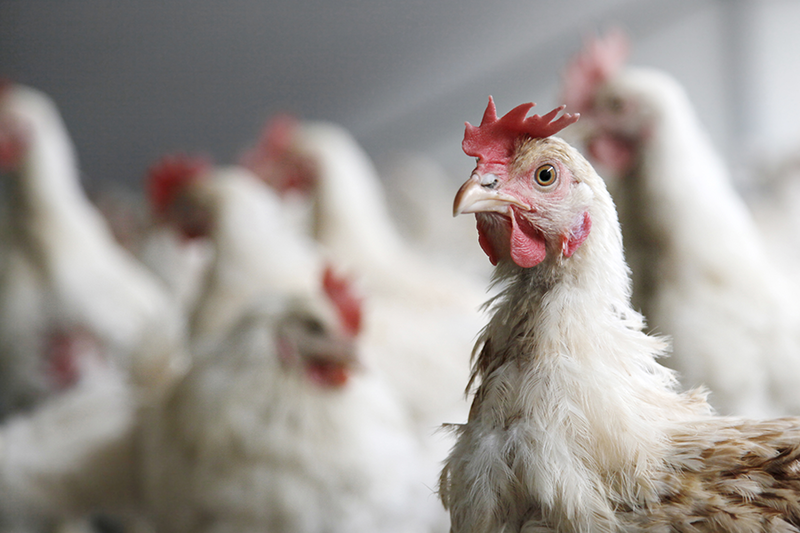 Today, the American broiler industry cranks out over five billion chickens each year. At speeds of up to 90 birds a minute, automated killing, plucking, and dismembering machines process them into shrink-wrapped packages. 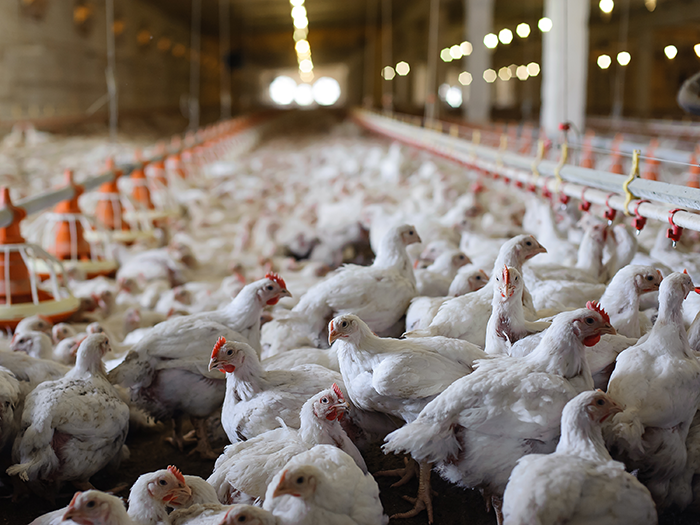 Debeaking and many of the other manipulations discovered by the broiler industry were quickly adopted by egg producers, and they, too, learned how to maintain huge flocks in factory buildings. But they had additional problems. One was chicken manure. An egg-laying flock stayed in the factory for a year or more, and the manure pile-up killed birds and ruined eggs. The other problem was the tedious manual labor in gathering eggs. Some poultry expert solved both problems by putting hens in cages. The manure dropped through to a waste pit or onto the floor where it could be scraped away. Eggs rolled across the cage floor into a collection trough, so that workers could walk along and quickly fill their buckets. At first, producers placed one bird to a cage. Soon they found that birds were cheaper than wire or buildings, and crowded cages became the rule. With five birds per cage, the same building produced about five times as many eggs. Crowding caused more birds to die, but the losses were more than offset by the huge increase in the flow of eggs. 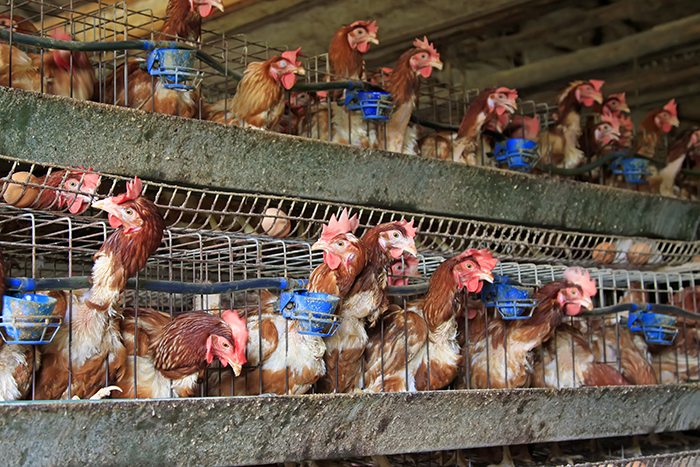 Soon, even the workers were eliminated as cage equipment manufacturers perfected automatic feeding troughs and conveyor belts to collect eggs. 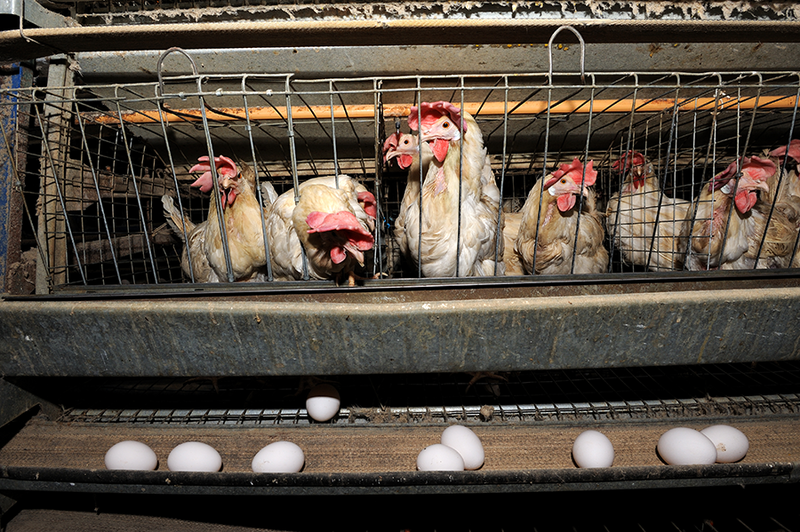 U.S. egg factories hold some 285 million hens in cages. 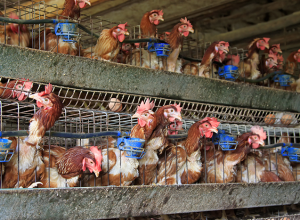 Virtually all of the nation’s eggs come from caged, debeaked hens. The poultry industries’ successes with factory technology were watched with envy by the livestock industries. By the 1960s, the principles of confinement, mass production, and automated feeding and watering were applied to systems for cattle and pigs. 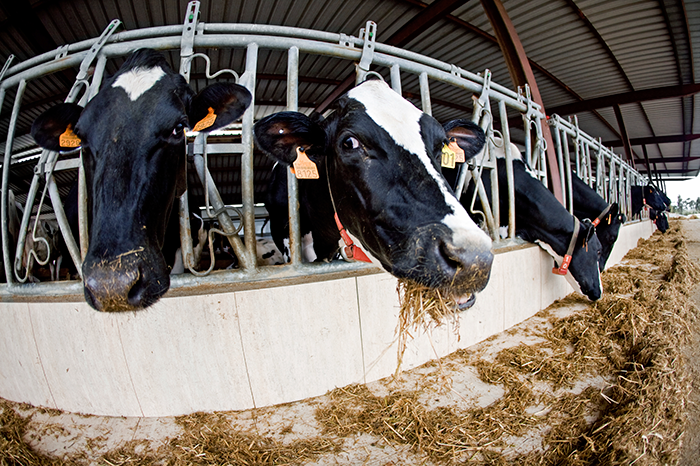 In the dairy industry, about half of the nation’s 10 million milk cows are housed in some type of factory system. In the beef industry, most of the nation’s top-grade beef comes from huge feedlots where animals are fattened on grain and growth promotants. 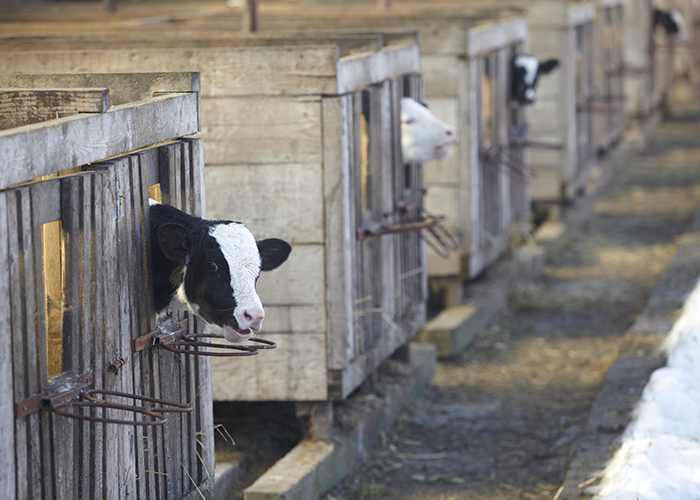 All of the “formula-fed” veal industry’s 1.2 million calves are raised under strict factory conditions. 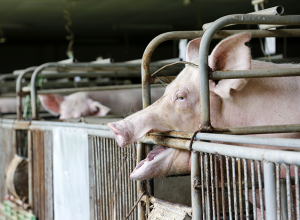 About two-thirds of the pork industry’s 80 million hogs a year are faised in “total confinement” factories where they may never see the light of day until they are trucked to slaughter. 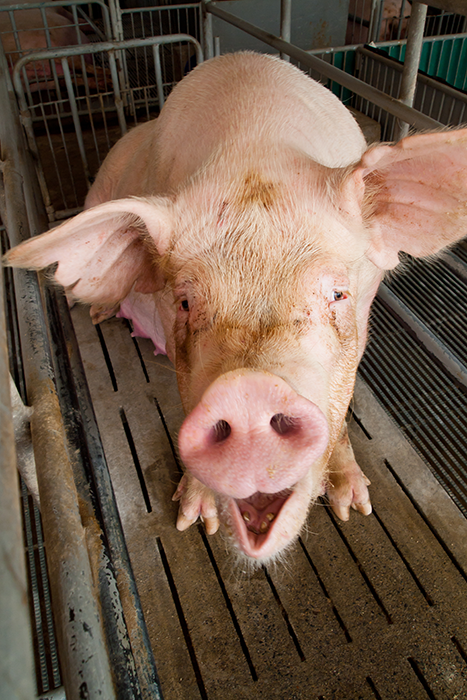 There is more to factory farming, however, than automated buildings, hardware, and equipment. They do reduce the chores of tending large numbers of animals, so they make mass production possible. They also aid the manipulation of animals’ growth and reproduction by giving the producer more nearly absolute control over the animals’ environment. In cold weather, for example, confined pigs tend to gain weight faster than pigs outside because more of feed energy goes to fat than to creating body heat. But the rest of factory farming consists of animal breeding and management. Everything about animals’ lives, their genetics, diet, digestion, sexual behavior, social behavior — even their ab9ility to move about — is manipulated to try to force them to produce more. In some cases, animal physiology may be directly manipulated. In the feedlot beef business, for example, operators implant pellets of anabolic steroids in animals’ ears to speed up muscle growth. In the egg business, producers make hens lay eggs over a longer period of time by controlling lighting in the factory buildings. They know that birds lay eggs in the springtime, when the days are getting longer. Using light-proof houses and artificial lighting, egg producers create the illusion of eternal spring by keeping the light on a little longer each day. After about a year of this, the flock’s productivity drops and a producer may use a management technique called “force molting” to revive it. This manipulation shocks and disorients the birds by leaving them in the dark for a few days without food and water. A few birds die in the process, but most come through and begin producing all over again on a renewed phony springtime lighting routine. In the formula-fed veal business, producers manipulate calves’ diet and mobility in order to make their flesh pale and tender. One part of the strategy is to get very young animals and keep them soft and tender by denying them exercise. The other part is to manipulate diet and nutrition in order to cause anemia, which, in turn, produces pale meat. To carry out the strategy, veal producers buy day-old calves cast off by dairy farmers and place them in individual stalls in a confinement building. 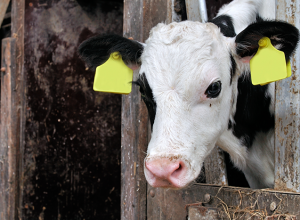 For fourteen to sixteen weeks the calf stays in a space barely larger than its own body, often chained by the neck to further restrict movement. Throughout this confinement the producer allows the calf only one food, called “milk replacer” — a mixture of dried skim milk, dried whey, starch, fats, sugar, mold inhibitors, vitamins, and antibiotics. 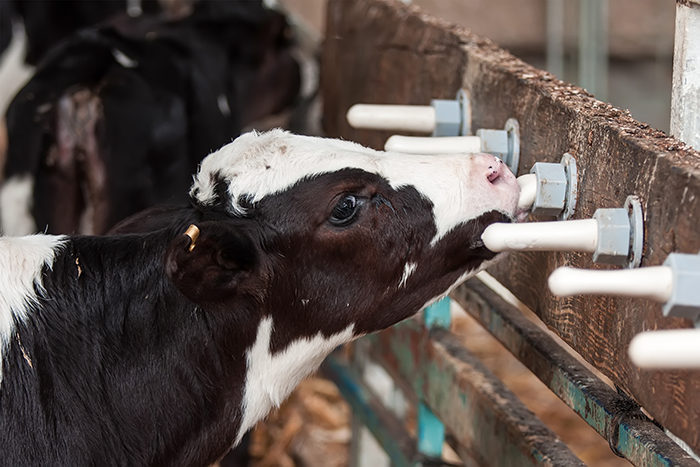 Long on fat and sugar but short on iron, the diet is designed to make the calves fatten quickly before the anemia gets too severe. Factory farmers would call their techniques “management,” but we could call them manipulations. 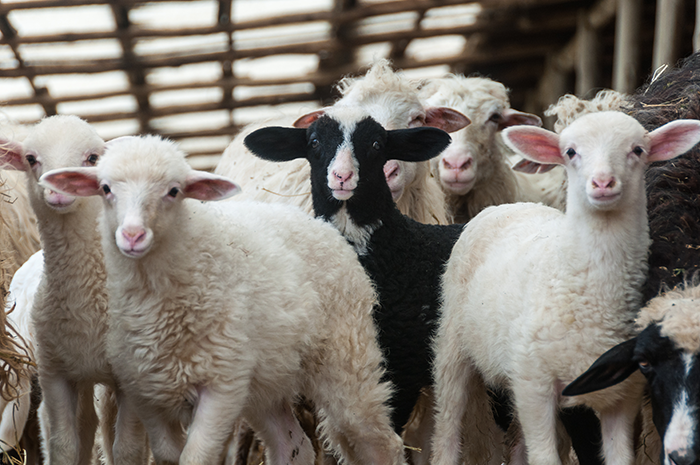 Many of them reach right into the animals’ bodies — to cut on them or change them in ways that boost production. We have already seen how debeaking of chickens became because it “controlled” cannibalism in unnaturally large, confined flocks. In many poultry factories, producers also cut off their birds’ toes just behind the claw. This “toe-clipping” is said to keep the birds calmer as it prevents fighting and “back-ripping.” In breeding flocks, producers may also cut off males’ wattles and combs. These “dubbed” males are not so competitive with each other on the crowded floor. Crowded pigs, too, have similar social disorders in confinement, and they tend to chew on each others’ tails. Occasionally, the tail-biting gets out of hand and some pigs kill and eat others. The non-invasive solution would be to put the pigs in a suitable environment where they can spread about and maintain a social order normal to pigs. But such an environment would make it difficult and time-consuming to feed, water, and tend to large numbers of pigs. So the factory farmer’s strategy is fix the pig so that it cannot tail-bite, then the confinement building can be packed with pigs. To ensure that stressed pigs cannot tail-bite, farmers routinely cutt off, or “dock,” the tails of young pigs a few days after birth. Females, too, get a share of sexual mutilations and manipulations. Much of it occurs in the techniques of ova or embryo transfer, which are used to get the greatest number of offspring from high-producing animals. If a dairy farmer has a cow whose annual tonnages of milk are breaking recores, her calves will bring very high prices because of the likelihood that they will have her “milky” genes. So the farmer injects her with fertility hormones to make her ovaries produce extra eggs, then flushes thoese eggs from her, artificially fertilizers them, and plants them in other, cheaper cows. The fertilized eggs are implanted in the surrogate mother cows through small incisions on each flank. In pigs, the ova or embryos are removed surgically. In pigs, the ova or embryos are removed surgically. If her genes are in demand, a sow may be cut open and sewn up six or more times a year. Aside from these deliberate manipulations of factory animals, there is a whole range of unintended ones that cause animal suffering. Crowding and stress tend to disrupt relations among animals, causing them to fight, bite and peck each other. Parent-offpsring relations, too, are disturbed in the factory environment. Mothers and offspring are unable to recognize each other because of the confusion of smells and sounds in large groups. In the pig factory, for example, a bored, detached sow may not recognize the squeals of one of her own litter should she roll over or step on one. The restrictive “farrowing stalls” are supposed to reduce these incidents, but some farmers claim that they don’t. Stress and confusion can cause some mothers to abandon their offspring and to refuse to accept their suckling; the same conditions can make the young unable to seek out their mothers. 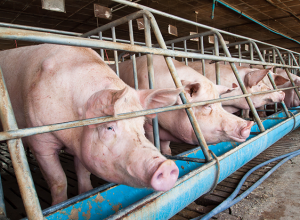 Pregnant sows suffer greatly in total confinement factories. The biggest operations house them in individual “gestation” crates or stalls, which, like the veal crate, are scarcely larger than the sow’s body. 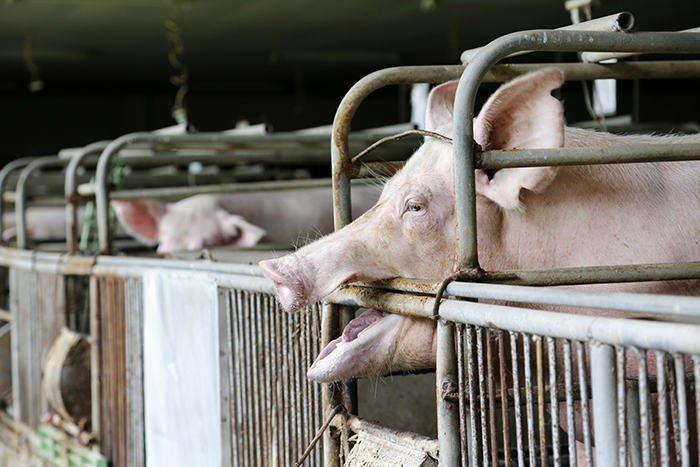 In a few factories, sows are “tethered,” that is, chained at the neck to keep them from facing the feed trough. 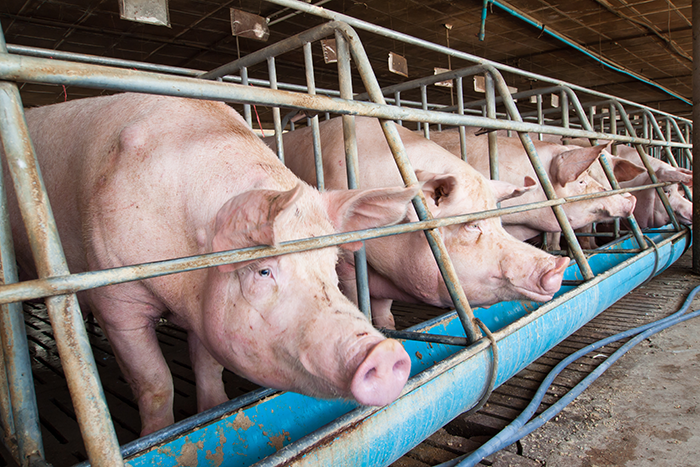 For sixteen weeks, pregnant sows are held in these devices — mainly for producers’ convenience. The crates and tethers make it easier to feed and control large numbers of animals for months at a time. The sows cannot turn aorund, run, walk, or otherwise exercise during their pregnancy, and to keep them from becoming obese, factory farmers feed them every third day. In many factories, they are kept in the dark to keep them from biting and fighting back at their stalls. Many act out their stress and boredom by repeated biting, chewing, pawing, swaying, head waving, and other stereotypic motions known to be symptoms of frustration. 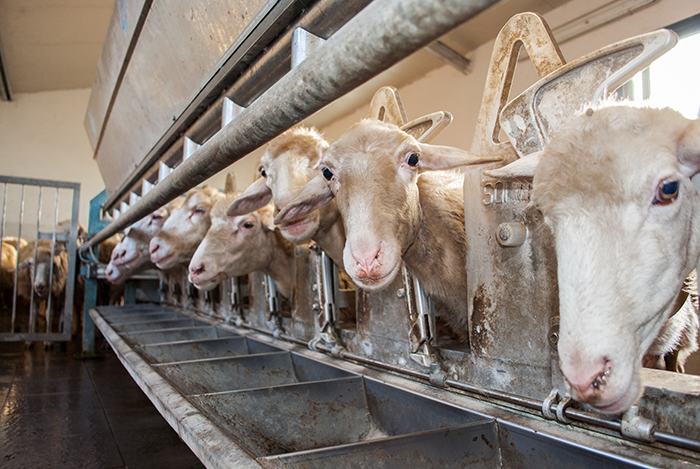 Factory conditions take a further toll on animal well-being in two ways. 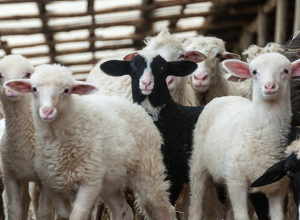 One is what producers call “depressed performance” or lowered productivity; it means that the animals aren’t growing and thriving as well as they should. It may be because the animal can’t compete with others to get to feed or it may be due to a low-level illness. Because factory buildings are usually in use year-round and isolated from the cleansing effects of sunlight and rain, they develop what producers call “bacteria buildup.” A producer may have relatively few animal health problems in a new factory building, but eventually the interior becomes infested with a variety of germs. Farming magazines indicate that both pig and dairy factories are plagued with disease epidemics that are made worse by confinement conditions. According to the National Research Council, “national data indicate that approximately 50 percent of dairy cattle in the country have mastitis” — an infection of the cow’s mammary glands. There are obvious manipulations and the sufferings they cause. But the list would not be complete without looking at what we might call “bred-in” sufferings; that is, ones caused by genetic selection for high-producing animals. Probably the most genetically manipulated factory animals are, in order, poultry, dairy cattle, and pigs, and they suffer accordingly. For decades now, poultry geneticists have been relentless in selecting for big-breasted, fast-growing birds. The modern turkey is so top-heavy that males cannot mount and breed females, so hatcheries employ teams of workers to artificially inseminate their hens. 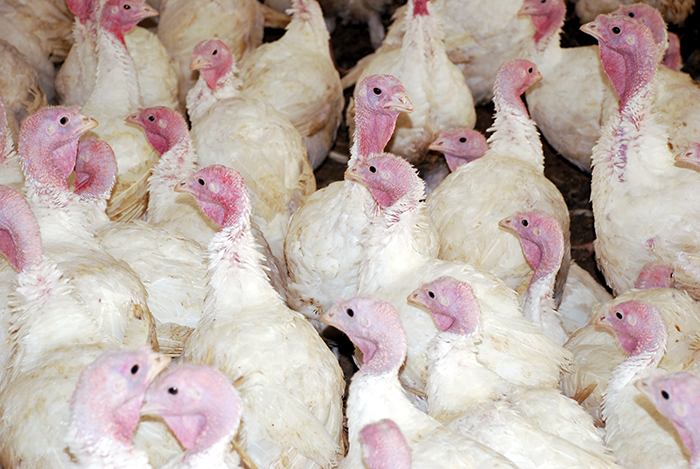 Both turkeys and broilers grow so heavy that the birds crouch and crawl on their realtively underdeveloped legs. Their sides and chests rub against the manure-soaked floor, they lose feathers, and eventually their skin becomes sore and infected. 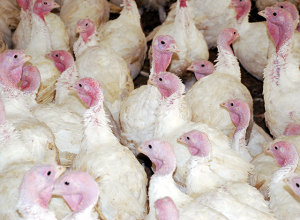 Called “breast blisters” and “scabby hip,” the conditions plague broiler and turkey factories. Broiler chickens suffer, too, from the “flip-over” or “sudden death” syndrome, also linked to rapid growth. 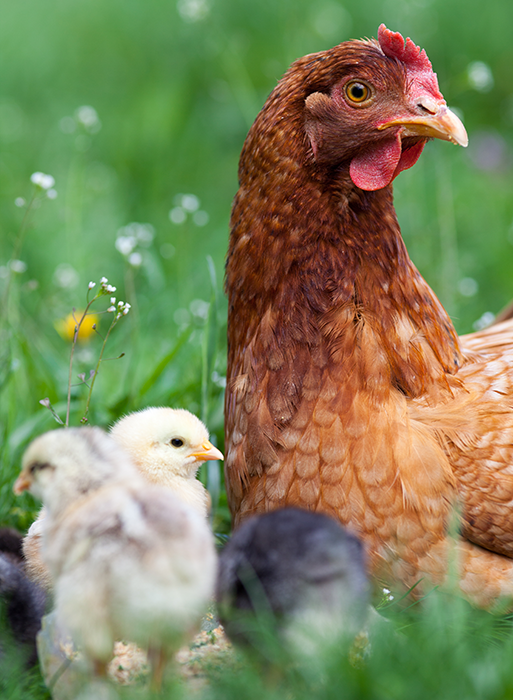 According to a poultry expert, it “is characterized by birds jumping into the air, sometimes emitting a loud squawk, and then falling over dead.” It is most prevalent in the biggest, fastest-growing flocks. Perhaps the most insidious growth-related disease is ascites, “waterbelly,” or pulmonary hypertension syndrome. It occurs in the fastest-growing birds because their heavily-muscled bodies need oxygen faster than the lungs can provide. This makes the right side of the heart work harder, it enlarges, blood pressure builds up in the vessels to the lungs, and eventually the bird dies of heart failure. Dairy cows have been so genetically specialized that some herds produce an annual average of 25,000 pounds of milk per cow, with some individual cows producing 50,000 pounds. 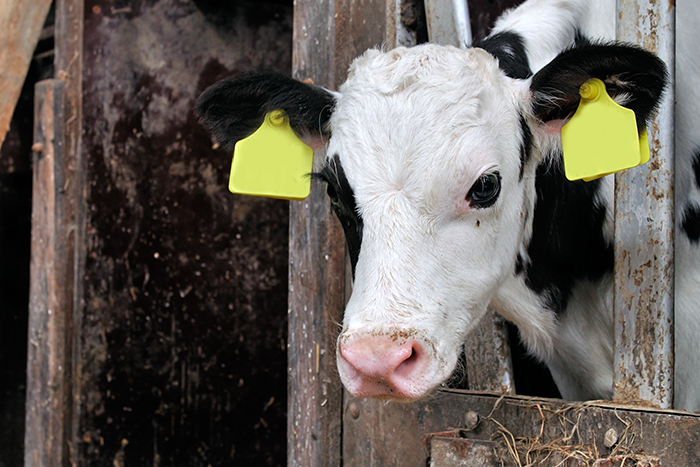 At these rates, a cow is producing 20 to 40 times her weight in fluids each year. She is, like the broiler chicken, a metabolic monster — a souped-up body that burns like a fighter jet. Bear in mind, too, that she is giving milk because she has just born a calf. After a month or two, she will be artificially inseminated and will be pregnant again even while she puts out milk for the first calf. (The calf, of course, is removed so that all of her milk can be sold.) Her body-pumping out milk while feeding a growing calf inside needs lots of energy and nutrients. More, sometimes, than she can get from her feed; she suffers ketosis, or negative energy balance, and she draws energy from her own tissues. In this state, cows are weak, susceptible to stress and diseases. Pigs, like turkeys and broiler chickens, have been bred to grow too heavy for their legs and feet. And breeding for a long-bodied, “meat type” hog has somehow produced an excitable animal. Factory pigs, then, are prone to both lameness and injuries from fighting and struggling under stress. According to a survey of market hogs, nearly 90 percent had signs of osteochondrosis, which leads to synovitis, degenerative joint disease and crippling. After this litany of problems with suffering, diseases and sagging productivity, you may well ask: “How, then can factory farming be so successful?” You would think that factory animals would either die or refuse to grow in such numbers that the operation would lose money. But it is profitable in spite of the problems because of the various manipulations … er, management techniques. 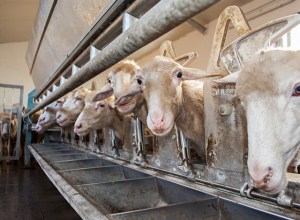 Even though general factory conditions tend to hurt animal health and productivity, they are shored up by genetics, drugs, hormones, mutilations and other manipulations. The super milk cow, for example, cranks out so much milk that she makes money even if she has mastitis a month at a time. Fast-growing broiler chickens produce so much meat on so little feed that the factory makes money even if a great many birds die of “flip-over” or ascites. The skeptic must understand that factory profitability comes from volume, or mass production, not from pampering individual animals. This is made clear by the hundreds of scientific studies on the economics of crowding. Although it seems to defy common sense, greater crowding of animals raises both death rates and profit margins. Studies on this go back to the 1930s and they all confirm the profitability of crowding. All of these facts should be disturbing — if the self-protective doors of the mind can be stopped from slamming shut. Prop them open and ask yourself some questions: do we have any right to make animals live such miserable lives just to supply cheap meat, milk, and eggs — just to satisfy appetites that are proving to be bad for our own health? In view of all this misery and killing and its cumulative effect on human health, can we say our society is either sane or humane? Can we say that we truly care for the earth, for its cycles and processes, and for all the beings who keep it a living planet? In my view, the reduction of animals to tools, slaves, and resources was wrong to begin with and it has been taken much, much too far by factory farming. By reducing animals, we have become unable to accept them as fully living beings entitled to autonomy and respect. We keep up the Great Gap between us and other beings, and it is the major barrier to any genuine improvement in our sensibilities toward, in our relations with, the rest of the living world.